For ages now I've been buying bits in and talking about a bedroom makeover but it all seemed so far away and like I'll be talking about it for a few years before it even comes close to happening. BUT this week with the help of my sister-inlaw my new bedroom is done! Decorating wise all that's left to be done is some more furniture buying and some finishing touches. 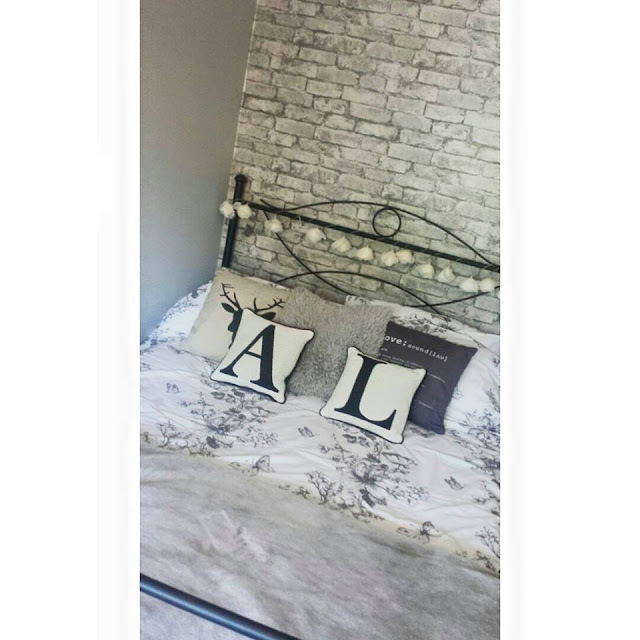 I'm gutted I didn't get any before and after pictures just to capture how far it's come, This bedroom is the first ever completed bedroom I've had since moving to this house in 2010 every other room always needed something finishing and never had the cosy feel to it just a room to sleep in and store my many clothes. Before this I had a green bedroom with one wall wallpapered with a cream and floral print wallpaper which had a strip missing because I didn't have enough paper and that's how it stayed, I never had all the little finishing touches with matching bed sets like I do with this room. At last a room I can go into and relax without sighing and just wanting to get out as soon as possible, everything has it's place and it's so spacious as I'm getting my hoarding into check and have decluttered crazy amounts of stuff I've hung onto for so long. 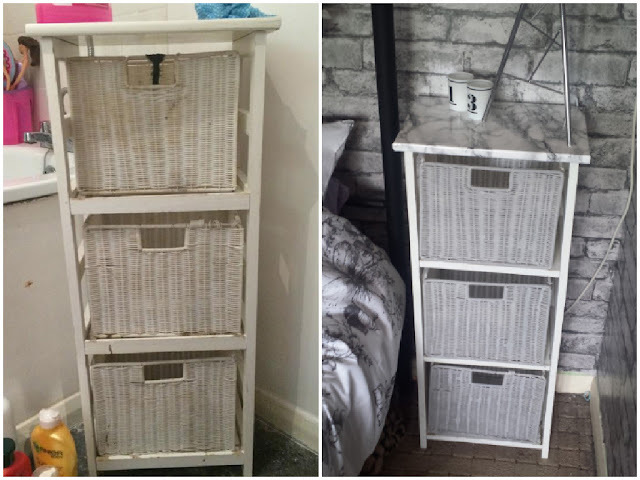 A friend offered me a little drawer unit she'd had in her bathroom and had spilt some hair dye on, Of course I couldn't say no I didn't really have any idea on what I'd do with it or where I'd put it but while finishing off the last coat of paint on my wall I wondered what it would look like with grey drawers to match my painted walls, Not expecting much of a result I didn't grab any in depth before and after pictures. A little while a go I planned to buy my bedside cabinets from my local YMCA charity shop but the tops were a little grubby but rather than writing them off because of that I bought some marble effect vinyl to cover the tops with but they had sold when I finally decided to go ahead and buy them after weeks of uming and aring so with that still in my cupboard I put it to use to cover the top which had the most hair dye damage and these are what I've ended up with, These are only temporary until I can get my ikea drawers but they will still play a big part in my room as I've fallen in love with them. Although not alot of work went into them I'm really proud of them.